Vitex agnes grows well in warm temperate climates and may be grown successfully in the North Island, New Zealand. We now have several mature bushes that are fruiting. Parts used are the berries though leaves can be used as well. The image above has been taken at our place. the plant is around 5 years old and is finally fruiting. We have around 10 plants grown for experimental purposes. Agnus castus has been used for thousands of years for its beneficial affect on the female hormonal system. The seeds and fruits are anaphrodisiac, aphrodisiac, galactogogue, ophthalmic, sedative, stomachic, women’s complaints. The berries of this plant have a range of medicinal actions but possibly the most important is its ability to rectify hormonal imbalances caused by an excess of oestrogen and an insufficiency of progesterone. It acts upon the pituitary gland, reducing the production of certain hormones and increasing the production of others, shifting the balance in favour of the gestagens. Vitex agnes has a wide application of uses in malfunctions of the feminine reproductive system and has been used with great effect in restoring absent menstruation, regulating heavy periods, restoring fertility when this is caused by hormonal imbalance, relieving pre-menstrual tension and easing the change of the menopause. Flavonoids,, alkaloids, diterpenoids, vitexin, casticin and steroidal hormone precursors have been isolated from the chemical analysis of Vitex agnus-castus. It is believed that some of these compounds work on the pituitary gland which would explain its effects on hormonal levels. A study has shown that extracts of the fruit of VAC can bind to opiate receptors; this could explain why intake of VAC reduces PMS discomforts. That the berries increase female progesterone inhibiting male androgens. That the active ingredients in this herb works by regulating the pituitary gland, which sends signals to other glands instructing them of how much of each hormone to make. Bitter sweet slightly astringent relaxant herb that regulates hormonal functions. German researchers suggest that the berries increase the production of luteinising hormone and prolactin. After reviewing German research, the herbalist Christopher , suggests its use during the first three months of pregnancy to help prevent miscarriage. Another study has found that it increases the production of the hormone progesterone. Prolonged usage restores corpus luteum function. Have been found to assist in the relief of paralysis, pains in the limbs, weakness etc. Good evidence and safety exists for its use in cyclical mastalgia and luteal phase defect. Vitex agnus is mildly sedating and can be used as a long acting calmer for shows. Extracts form vitex agnus berries can bind to opiate receptors helping relive pain associated with hormone issues. Is effective in preventing and damping stallion behaviour particularly at shows with out affecting fertility. This herb has been used to dissolve cysts and fibroids. 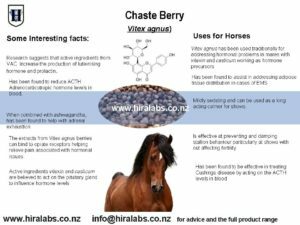 Chaste berries may be used to re-establish normal ovulation.The active ingredients vitexin and casticum are believed to act on the pituitary gland to influence hormone levels. May be used for infertility and insufficient lactation. One of the most surprising medical uses is its success in treating Cushings disease and has been found to reduce ACTH (Adrenocorticotropic Hormone) levels in blood. Berries may be given 3-4 months prior to being served, or during periods of marish behaviour and during lactation. Used with Ashwagandha may help with adrenal exhaustion. Used in conjunction with St John’s wort for unpleasant symptoms associated with menopause. May help with PMT and insulin fluctuations associated with prementrual tension. Improves female libido while in some cases seems to suppress male libido by inhibiting production of dopamine. The berries are considered to be an aphrodisiac, though other reports say that they are anaphrodisiac. The reason for this apparent disagreement is that the berries have a regulating effect on the body and so are likely to increase sexual activity in those who are not very active in this area whilst reducing it in those who are very active. May help with mild forms of Cushings and adrenal exhaustion. May be used between litters to address any hormonal imbalances and improve fertility. Used with St John’s wort may help with aggressive behaviours in male dogs. Some caution is advised since excessive doses can cause a nervous disorder known as formication, which manifests as a sensation of insects crawling over the skin. Chaste Berry may interfere with progesterone-containing medications. While it may be used to prevent miscarriage, this herb must not be used on pregnant animals without professional guidance from a vet well versed in botanical remedies. Do not take during lactation as it may affect serum prolactin levels. DISCLAIMER: Hira Laboratories will not be held responsible for the use or misuse of any information used in this article. We recommend that either a qualified herbalist or your animal professional carry out diagnosis and subsequent treatment. Herbal remedies must not be given not be taken in conjunction with other medication with out consulting a medical professional.